So you love the scan-anything-anytime freedom of your VuPoint Magic Wand scanner but want a hand when it comes to multi-page jobs? Now you can magically turn your wand scanner into a desktop scanner. Just connect your Magic Wand 4 to this portable docking station and it automatically feeds your documents through just like a desktop scanner and even charges your Wand while you work. No magic words or spells required. 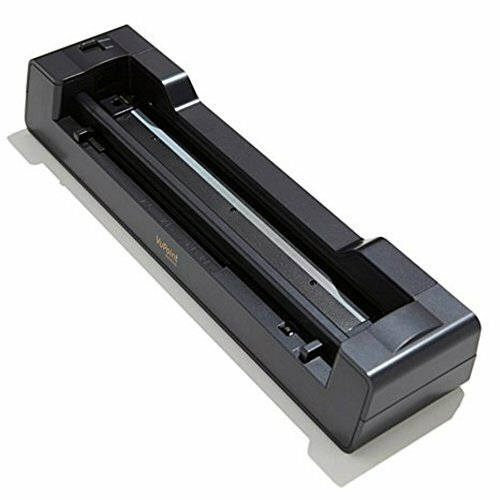 When used with a VuPoint Magic Wand scanner, this docking station combines the best features of a portable scanner and a desktop scanner, yielding a convenient hands-free experience. When in use, the dock will charge your magic wand scanner while scanning documents and photos simultaneously. The built-in high speed sensor provides a precise and efficient experience. When docked, scan in color or black and white with a resolution of 300, 600, or 1200 dpi, along with JPG and PDF output. Use the adjustable guide tab to scan many paper sizes. Compatible with VuPoint Magic Wand model PDS-ST470-VP and model PDSWF-ST47-VP. System requirements: Windows 10, Windows 8, Windows 7, Windows Vista, Windows XP; Macintosh OS X 10.4 or newer. Docking station only, scanner not included.